I offer a workshop on deep learning with Keras and TensorFlow using R. Date and place depend on who and how many people are interested, so please contact me either directly or via the workshop page: https://www.codecentric.de/schulung/deep-learning-mit-keras-und-tensorflow/ (the description is in German but I also offer to give the workshop in English). Durch das stark wachsende Datenvolumen hat sich das Rollenverständnis von Data Scientists erweitert. Statt Machine-Learning-Modelle für einmalige Analysen zu erstellen, wird häufiger in konkreten Entwicklungsprojekten gearbeitet, in denen Prototypen in produktive Anwendungen überführt werden. Keras ist eine High-Level-Schnittstelle, die ein schnelles, einfaches und flexibles Prototypisieren von Neuronalen Netzwerken mit TensorFlow ermöglicht. Zusammen mit Luigi lassen sich beliebig komplexe Datenverarbeitungs-Workflows in Python erstellen. Das führt dazu, dass auch Nicht-Entwickler den End-2-End-Workflow des Keras-TensorFlow-Modells zur Produktionsreife leicht implementieren können. Upcoming talks, webinars, podcasts, etc. Past talks, webinars, podcasts, etc. On March, 26th, I gave my talk about Explainable Machine Learning at the data lounge Meetup Bremen. Slides are here. On March, 15th, I talked about Deep Learning for Software Engineers at the AccsoCon 2019. You can find my slides here. At the This week in machine learning and AI European online Meetup on December 5th, 2018, I presented and led a discussion about the Anchors paper, the next generation of machine learning interpretability tools. You can find the slides here. On November 7th, Uwe Friedrichsen and I gave our talk from the JAX conference 2018: Deep Learning - a Primer again at the W-JAX in Munich. While in London for the M-cubed conference, I also gave a talk at the R-Ladies London Meetup about Interpretable Deep Learning with R, Keras and LIME. From 15th to 17th October 2018, I was in London for the M-cubed conference with my talk about Explaining complex machine learning models with LIME. In August 2018 I gave a webinar for SAP about Explaining Keras Image Classification Models with LIME. In June 2018 I gave a 3-hour workshop about the basics of machine learning with R at the University of Heidelberg, Germany. Slides and workshop code can be found here. In May 2018 I was at the ROpenSci unconference in Seattle, WA You can read about my experience and the project I worked on here. Traditional machine learning workflows focus heavily on model training and optimization; the best model is usually chosen via performance measures like accuracy or error and we tend to assume that a model is good enough for deployment if it passes certain thresholds of these performance criteria. Why a model makes the predictions it makes, however, is generally neglected. But being able to understand and interpret such models can be immensely important for improving model quality, increasing trust and transparency and for reducing bias. Because complex machine learning models are essentially black boxes and too complicated to understand, we need to use approximations to get a better sense of how they work. One such approach is LIME, which stands for Local Interpretable Model-agnostic Explanations and is a tool that helps understand and explain the decisions made by complex machine learning models. 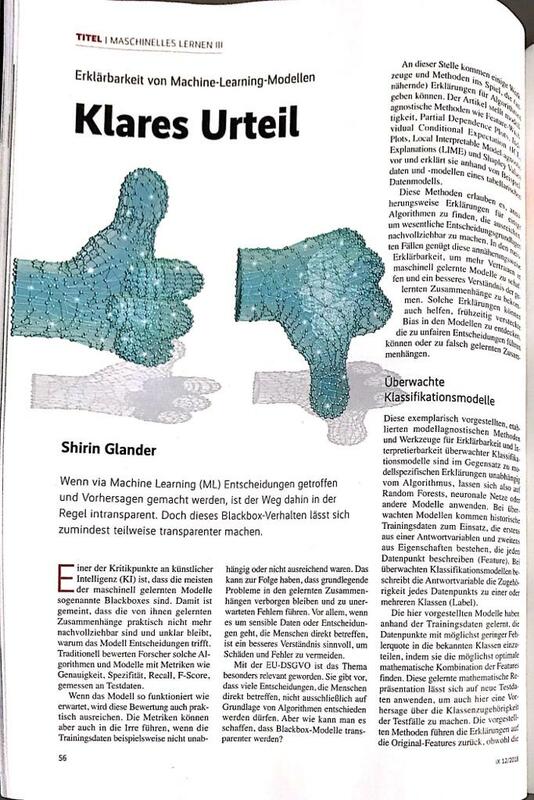 Dr. Shirin Glander is Data Scientist at codecentric AG. She has received a PhD in Bioinformatics and applies methods of analysis and visualization from different areas - for instance, machine learning, classical statistics, text mining, etc. -to extract and leverage information from data. Introducing Deep Learning with Keras and Python Keras is a high-level API written in Python for building and prototyping neural networks. It can be used on top of TensorFlow, Theano or CNTK. In this talk we build, train and visualize a Model using Python and Keras - all interactive with Jupyter Notebooks! In January 2018 I was interviewed for a tech podcast where I talked about machine learning, neural nets, why I love R and Rstudio and how I became a Data Scientist. In December 2017 I talked about Explaining Predictions of Machine Learning Models with LIME at the Münster Data Science Meetup. In September 2017 I gave a webinar for the Applied Epidemiology Didactic of the University of Wisconsin - Madison titled “From Biology to Industry. A Blogger’s Journey to Data Science.” I talked about how blogging about R and Data Science helped me become a Data Scientist. I also gave a short introduction to Machine Learning, Big Data and Neural Networks. In March 2017 I gave a webinar for the ISDS R Group about my work on building machine-learning models to predict the course of different diseases. I went over building a model, evaluating its performance, and answering or addressing different disease related questions using machine learning. My talk covered the theory of machine learning as it is applied using R.